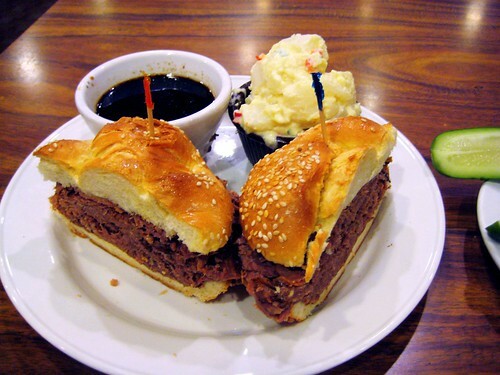 A few years ago, I made a promise on this blog that I would reveal my favorite place for French Dip sandwiches after I did a review on for both Cole's and Philippe The Original . It was a battle for supremacy on who was the inventor of the French Dip sandwich as both have stories on how they come up with au jus sauce and the way the sandwich was dipped in to invent that unique way of eating that sandwich. Somehow I could care less on who invented, but rather on who has the best in town. My answer to this debate is Larry King's favorite breakfast joint in his neck of the woods. 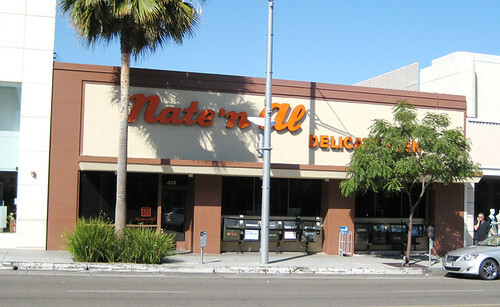 Surprisingly, my favorite French Dip sandwich is at "Nate 'n Al". My initial reaction coming here was that I hoped I didn't have to bump into Larry King or some old foggy pseudo celebrity because I wanted to take a few picture without them thinking I was part of TMZ snapparrizi that is usually outside stalking at Wolfgang's Steakhouse or Spago's. The charming thing about the place was that it looked as if they kept the place the same since they had opened in the mid 40's. The booth seats looked it belong on the set of the restaurant scene in the movie "L.A. Confidential" where many of the area depicts a vintage Hollywood set. The place doesn't feel old, it just gave the feeling of prestige...the older kind. They still have a big selections of deli meat on board for take outs. I could had swore that every bald husky guy looked like Rob Reiner coming in and ordering various deli meat for their midnight snack. 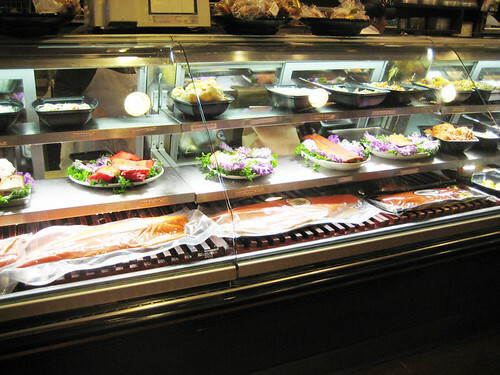 The selections of meat on display in the refrigerated counters can probably rivaled "Canter's" for their pick of the deli. Without further ado, we got to see the sandwich on hand and really debate about the selection I had made. The au jus sauce was not as sweet like Cole's or Phillipe's. What's so remarkable about the sandwich was the sesame bun. It was not very thick or harden like the other two because dipping into the sauce will obviously make the bread more soggy. Here's another benefit, you noticed the sauce is put on the side and not pre-dip. That was a big plus in this humble reviewer's eyes. The bread itself is firm, but also fluffy enough to withstand the post dipping carnage of not disintegrating into smooshy texture like the potato salad that accompanied it. The beef also get a textbook grade of A for excellence from me for being flavorable before the dip in the sauce and an added component of the sauce enhanced the taste even more. The other big cool thing about coming here are the pickles that are served here. I think they can bottled it and sell it in the chain of supermarkets. Very fresh and crunchy. After you snapped this, the sweet taste reminded me of the pickled cucumber I had when I was a kid. Definitely wishing I could take some of these pickles back home if it was made available. My big discovery of the day was something that elevated my horizon a bit when I saw the noodle pudding that was served. I knew with my curiousity, I got to order that. 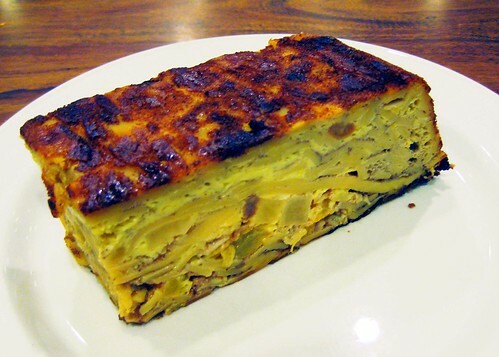 I later figured it out that it was also called "Kugel". As you can observed, it's baked like a sliced of an apple pie with layers of egg noodles that resembles a cut of pastas. If you are asking me if I ever had a Jewish or Middle Eastern dessert such as this, I would be pleading as though I was a newbie and would have wrongfully guessed it looked like the popular Latin dessert of Tres Leches. The dessert was absolutely fantastic as I could not stopped eating this delicious food as I though I had never encountered before. Since then, I had tried other Noodle pudding or noodle kugel, but alas not one of those places can match Nate n' Al's version of this traditional dessert. The pretender's version tend to either be too soggy like a Tres Leches or just had too bitter of a taste with too much of different different flavor taste. Can't figure it out if they had some secret milk ingredient they had where the other places are missing such component in this dish. After the delicous meal, I wasn't going to leave empty handed and order another batch of French Dip sandwich. Nope, they didn't pre-dip either. That's what I love about this place as they have kept the au jus sauce on the side. I also took home an order of hot pastrami sandwich as well since I want to compare that sandwich against "Johnny's" and "The Hat". Again, no comparison. Hands down I would give the nod to Nate n' Al's over the other two as well. The pastrami was much more flavorable and much tastier than the oversteamed versions that was served at the other two establishments. The rye bread and sweet pickles alone would smash the other two if a comparison battle needed to be done, but I spared the other two for further punishments as their sandwiches paled in comparison. Before we all jumped in, considered this...there is a reason why Larry King can afford to eat like this day in and day out. The sticker shock will probably scared off most casual diners, but I do think the quality itself on all of the sandwiches and deli items are worth it. Plus they are catering to a certain crowd in one of most recognized zip code in all over the world. Regardless of the price, they are still packing them in, which is no longer a marvel to me because I can attest to why they are popular. 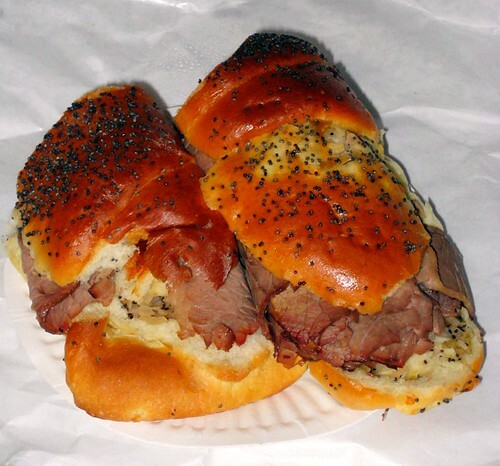 They still have the best French Dip sandwich in town and now I can add hot pastrami sandwich to the list as well. You can take home the pickles. They sell them by the jar at the deli counter. Also, N n A has the BEST potato salad EVER. 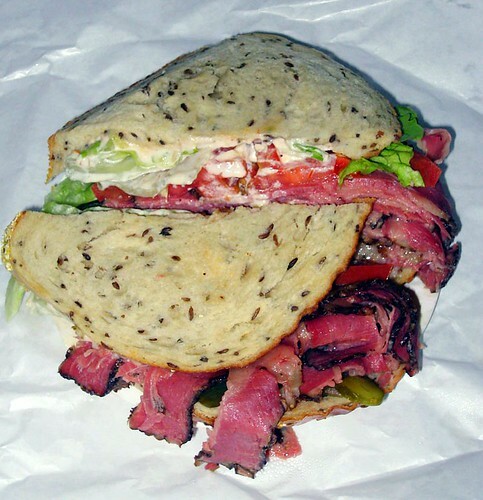 As for pastrami, just can't beat Langer's. Thank you very much for this tidbit! 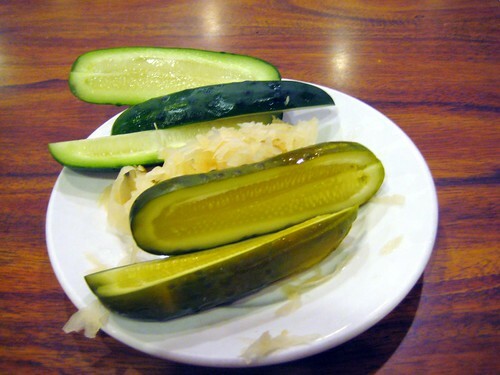 I really liked the pickles served at Nate N' Al. I can't disagreed with you about the potato salad in this place either. As in for Langer's, tough call. I know they get a lot of supporters at this place for Pastrami, but I'll go back and give it another go. Definitely though I would chose Langer's over The Hat or Johnny's.